Years ago we lived in a much loved old dump of a house. On that day I was away and Meg had locked herself out of the house! This was very inconvenient as her father and our very young niece Stephanie had just turned up for a cup of tea. Meg inspected the house from the outside, as one does on such occasions, and managed to spy her handbag through the bedroom window. She knew it contained the house keys and fortunately the quarter of the window was open. Stephanie, her grandfather and old Tudor watched Meg with quiet admiration as her mental gears started to grind. It is a well known fact that humans are only slightly more intelligent than border collies, so Meg decided that she had to solve this problem with the help of the dog. The open part of the window was too small for a human adult to climb through and wee Stephanie would have broken her neck once she was through the window. Tudor, on the other hand would just about fit through the opening and he had rubber bones. He had also been trained to go and fetch practically anything and presumably would - with plenty of coaching - manage to retrieve the handbag and bring it close to the window. How the bag could then be retrieved was a bit problematical, but a hook attached to a long stick poked through the window seemed one promising scheme. The plan had matured and it was time for its execution. Tudor was a magnificent jumper, but even he couldn't have taken a leap and sailed through the small window - hence the application of science was called for. After a considerable amount of planning, wriggling and preparation the following situation ensued. Meg had found a wooden plank and she pushed it through the fan light. Shortly after her father was supporting the plank with his shoulder while Meg lifted the wriggling collie and parked him on the plank. 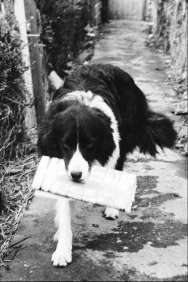 Now, this is not an ordinary occurrence for a border collie, but old Tudor had been exposed to so many crazy schemes that he took this one in his stride - while firmly clamping himself to the plank in case of earth quakes. Wee Stephanie watched all this with childish amazement and kept asking in a loud voice: "What are you doing to the dog, Auntie Meggy?". "Quiet, Stephanie, you'll see in a minute!" At this stage it is easy to lose track of the plot: The plank, supporting the dog, was to be pushed through the small window and then tipped slightly in order to induce him to jump onto the bed below. From there he would make his way to the handbag, encouraged by yells of: "Go on, pick it up!". After this he would drag the handbag to the window, from where it would be recovered by a yet unexplained, but hopefully brilliant method. Meg got her father to slowly push the planked dog through the window, while she tried to accelerate Tudor by heaving at his bushy rear. The mechanics of the endeavour were sound and it should have worked - if it hadn't been for Tudor's astonishment. Like the flamingo in 'Alice in Wonderland' who, when misused as a croquet mallet, insisted on spoiling the sport with an inquisitive turn of its flexible neck, Tudor, every time he was nearly through the window kept on wriggling around and, with an embarrassed expression on his black and white face, seemed to ask: "What is going on here? Why are you shoving at my arse?". At the same time wee Stephanie kept gulderin': "What are you doing with the doggy, Auntie Margaret?" and her granda commented in a low voice: "You shouldn't do that do the poor dog!". Meg finally collapsed convulsed with laughter and realized that this scheme was just too funny to pursue. They all had to wait for my return to get their cups of well deserved tea. Tudor looked somewhat disappointed.